What do you wind up with when you shave a couple of ounces here and a couple there from an already lightweight and well-designed carry bag? If you’re Sun Mountain, you get is a 2.5 pound strikingly good looking stand bag, with efficient pockets and four full length dividers. Their Two 5 bag has an 8.5 inch top, a full length pocket for clothing and convenient accessory pockets and we were impressed but not surprised by the quality of the construction and materials…all Sun Mountain bags are well thought out and well made. The legs are carbon-fiber, rather than aluminum, and a higher grade lighter plastic was used in the top and base plus to save ounces a fabric that weighs less with a lighter zipper were employed. 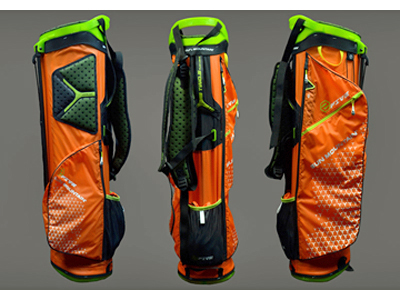 Projected to be in golf shops by June at a retail price of $229 and if my family is reading this—the Two 5 Bag is a great Father’s Day gift.